The A.R.K. : A Recovery Kit. Based on emergency personnel's incident command system, the A.R.K. is used by museums throughout Minnesota. Created to assist disaster recovery, the A.R.K. leads staff through the first 24 hours of a musem disaster. 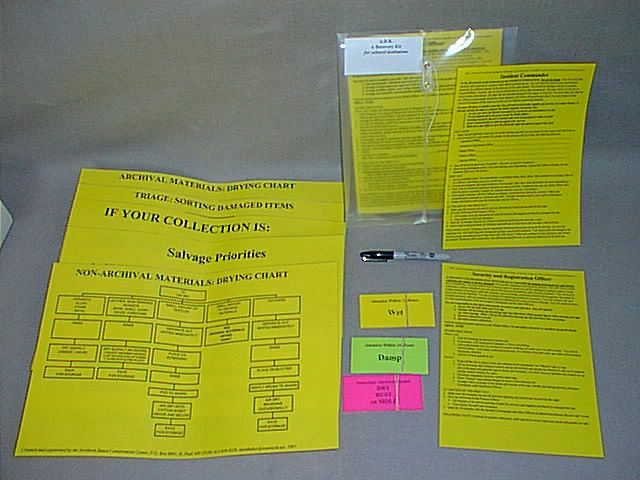 Applicable to any disaster, the kit provides six laminated position description cards with fill-in resource lists on each, five collection recovery posters, name tags, permanent marker and recovery priority cards. Packaged in a waterproof envelope. The kit should be kept in one to three staff members' cars, so it is immediately accessible.